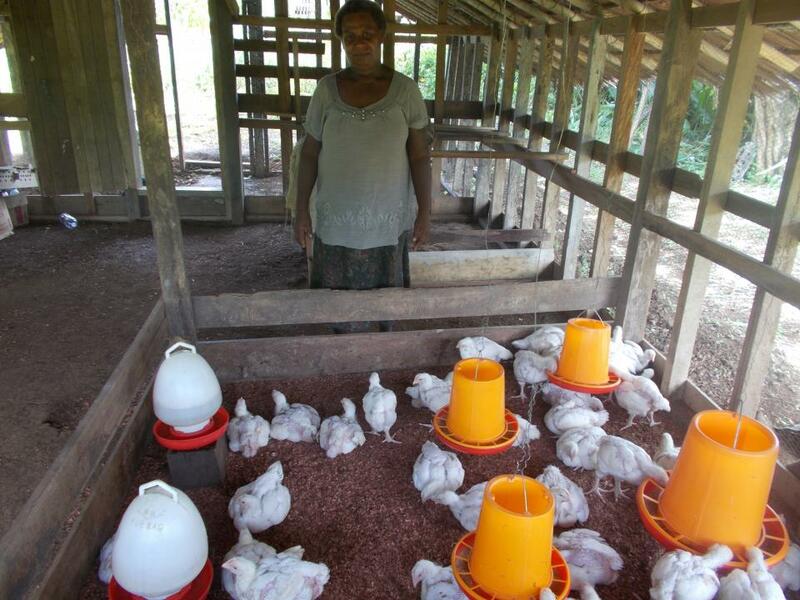 A loan of $1,100 helped to buy day-old chicks, starter, and finisher for her poultry business. Abigal is a 49-year-old woman who is married with four children. They live in their home in a village outside Honiara, the capital of Solomon Island. She runs a small poultry business where she farms chickens and sells their meats and eggs. She has customers in her community, and in restaurants and hotels in town. She has been in this business for six years. Abigal has taken a new loan from SPBD and use it to pay for additional day-old chicks, starter, and finisher to increase her stock and feed for her chickens. She plans to use her profits to meet her children's school fees and family's expenses. She joined SPBD in 2018 to gain access to financial services; her future goal is to improve her business to become profitable. Its goal is to reach financially excluded and underserved people. This loan is part of SPBD's efforts to reach out to financially underserved and excluded populations in the Solomon Islands. The country's microfinance industry is extremely under-developed resulting in many families struggling to get access to capital to make their businesses thrive. SPBD was launched as a MFI in 2012 with the aim of providing much needed capital to this island nation. By funding this loan, you are providing seed capital and allowing entrepreneurs to grow their businesses. South Pacific Business Development Solomon Islands (SPBD Solomon Islands) opened in 2012 and provides microfinance services to impoverished communities in the Solomon Islands. SPBD Solomon Islands provides loans that help-low income women start and maintain successful small businesses. In addition to loans, SPBD Solomon Islands offers other financial and non-financial services including voluntary savings plans, payment protection insurance, life micro-insurance, financial literacy and business training. Kiva shares SPBD Solomon Islands' goal to provide microfinance services to underserved, hard to reach populations. Funding on Kiva allows SPBD to expand their services in the Solomon Islands, where access to microfinance institutions is extremely limited. Kiva shares SPBD Solomon Islands' goal to provide microfinance services to underserved, hard to reach populations. Funding on Kiva allows SPBD to expand their services in the Solomon Islands, where access to microfinance institutions is extremely limited.